Chelsea Manager Antonio Conte has insisted he got his tactics right against City and doesn't know why there are critics from some of his players and the press. 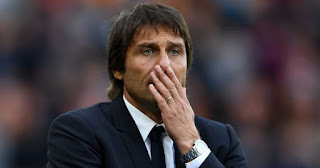 Conte insisted his plan worked just as he intended and the Chelsea coach also insisted he will continue to vary his attacking system depending on the opposition. He said: "The tactics were the same against Barcelona"
"Defensively, we were very good in both games. If you look at the stats, we conceded only two shots to Machester City, one they scored, and another after a free kick and [Cesar Azpilicueta] saved it on the line." "I didn't see a lot of shots on goal from Machester City, and this is very strange, Usually when you play against Manchester City they shoot about 20 or 25 times every game. For sure, compare that with the Barcelona game, I think we were not so good in ball possession. We missed a lot of last passes." "For sure, we have to improve. We have to improve in personality, especially when there is a lot of pressure from our opponent. But the tactics were the same against Barcelona and, against Barcelona, I didn't [hear] anyone complaining." "If I think it's right for the team to play in this way, it's okay. Otherwise, I can take another decision and play with a striker. I can take different decisions. There are three players for two places. One has to go on the bench. Then I have to decide who has to go on the bench." Do you think Conte got his tactics right against City?